A collection of balances, belonging to the Pharmacy of Havana, old drugstore La Reunion will open next Friday as part of the celebrations in Cuba for the International Day of Museums. Titled "From medicine grains to measuring is the story of the scales", the exhibition is a journey through the evolution of these tools of measuring that are vital to the performance of that scientific and trade activity in a drugstore. The Havana pharmacy, also known as Sarra, by the name of the owner and founder of this establishment in the nineteenth century, integrates with the drugstore Taquechel and Johnson a trilogy of the oldest pharmacies in the historic center of Old Havana. 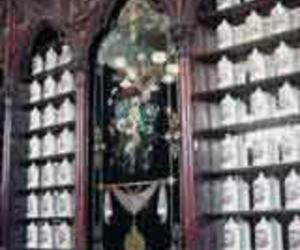 Located in Teniente Rey Street and Compostela, this pharmacy also treasures a vast collection of mortars and porcelain jars and other measuring instruments as scales. Its showcases also exhibit books with copies of formulas, a traditional activity of the oldest pharmacy in Cuba, in which pages were registered prescriptions and preparations. After reopening its doors in 2004, and after an intensive renovation, the museum is also developing a comprehensive educational program with lectures, conferences and workshops on quality of life, natural medicine, drug interactions and workshops for caregivers of Alzheimer patients.